The Jyeshtha Nakshatra is the 18th of 27 Lunar Mansions used in Vedic Astrology. Antares, one of the stars in Jyestha’s cosmic counterpart Scorpio, sits at the head of the Scorpion. Literally translated, Antares is the rival of Mars. This is due to its red colour and the fact that it sits opposite Mars every second year. 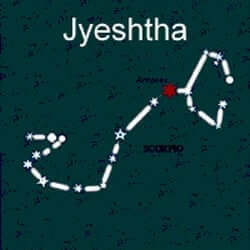 This Nakshatra or birth star pays tribute to Jyestha the eldest of the 27 nakshatra sisters. She was married to Soma who fancied her sister Rohini more than his wife. 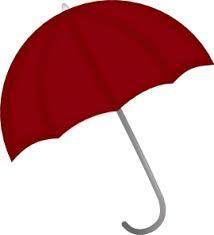 Symbolized by the umbrella, an earring or round talisman. The Jyestha character is the embodiment of betrayal and abandonment. Natives are haunted by Soma’s adulterous behavior and live in eternal fear of abandonment. Being the eldest of the Lunar Mansions, they tend to emit an air of superiority and as they are perpetually on the defensive, they may come across as arrogant. The Jyestha has trust issues and very few friends. They lead a very secretive life style and have a very small social circle. With wise and of superior intellect the native constantly seeks Dharma (Universal Truth). When out of balance the native’s quest for truth will become exhausting. Strong physical stature and good bone structure the Jyestha takes pride in their physical appearance and they are known to exercise regularly. Of average looks, they tend to have issues with their teeth that detract from their appearance. Quite stubborn, short tempered folks, the Jyeshtha tends toward aggression. Though they have sharp minds, they are inflexible and self-righteous. Known to make rash decisions, the native will regret some of the consequences of their impulsive reactions. Their spontaneous nature makes it difficult for these people to keep confidential information and will inadvertently cause problems for their family, friends and associates. Their rigid approach to life makes things more difficult than they need to be and can cause all sorts of hardship for the Jyestha. Known to begin their working life early, they are challenged to achieve great fortune or professional acclaim. They are prone to explosive bursts of anger which makes it difficult for them to maintain a stable income. It is common for these folks to live in poverty. After 50 years of age they find financial security. The people of Jyestha Nakshatra typically leave home earlier than their peers and are known to live far from the family home. When they settle down and make roots somewhere they become fiercely loyal to their friends and family. These natives love being grandparents and are known to have happy fulfilling marriages. Health problems may keep them away from the family home for extended periods. Plagued by myriad minor health issues, the Jyeshtha natives spend a great deal of time incapacitated by coughs and colds, gastro-intestinal problems, asthma, fever and issues with their arms and shoulders. Additionally, their fluctuating financial situation may cause anxiety and other mental health issues. Previous What Is The Sacral Chakra? Next What Is Your Personal Day Number?